☞ The HARISON 407 is a heavy duty inversion table that comes with many new features that set it apart from other inversion tables. ☞ Starting with its large backrest pad and soft touch foam handlebars, it provides a comfortable, easy inversion. But these features are just the basics. ☞ The HARISON 407 true balance system allows each user to find their own unique center of gravity. ☞ The 3 Angle Pin System allows users to trust that the HARISON 407 will easily, safely, and consistently deliver on the finest inversion experience. ☞ Inversion may help reduce back stress and strain by relieving pressure on the vertebrae discs and ligaments. Advanced heat and massage therapeutic inversion table; Large and comfortable padded backrest. 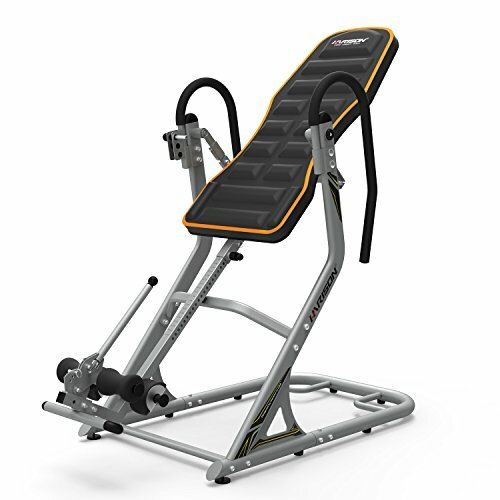 Heavy duty inversion table back stretching machine of space-saving design: measures 75 x 28 x 55 inches (W x H x D). The adjustable inversion table is suitable for people who are about 4.8 feet to 6.4 feet tall. Weight capacity: 265 lbs. Gravity inversion therapy table deluxe adjustable with comfort foam backrest and headrest, it`s helpful for back pain indoor exercise home fitness equipment. Three (3) position adjustable for easy positioning and safer inverting over strap systems, the ergonomically molded ankle holders provide comfort and security; inversion tables for back pain. If you have any questions about this product by HARISON, contact us by completing and submitting the form below. If you are looking for a specif part number, please include it with your message.